Duty is over and I am tired! Learning a lot about “Today’s College Student”. That is all I will say for now. I do still quite love them….AND I feel a little worried for them. Note to self: Add “EVERY STUDENT ON OUR SHIP” to prayer list. 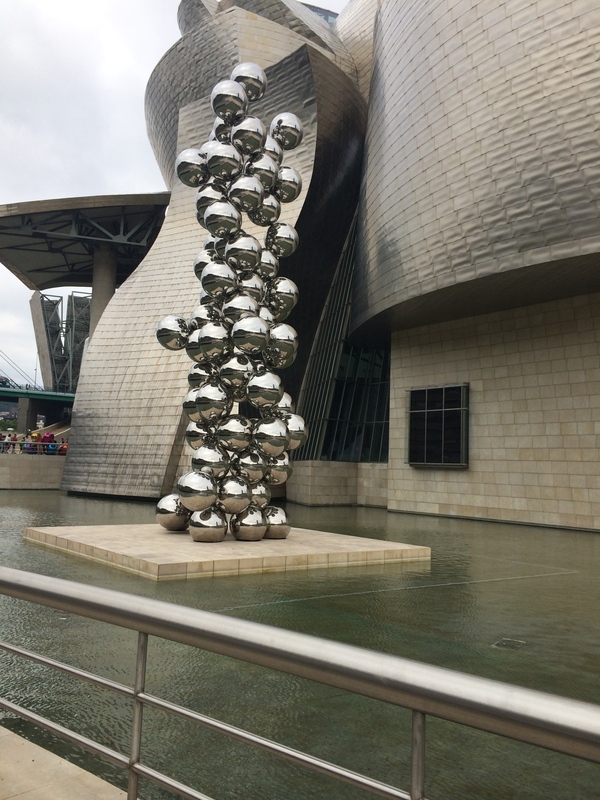 Went to the Guggenheim Museum here in Bilbao yesterday – soooo interesting! Modern art – which can be hard for me to understand…there was a pretty unique Yoko Ono exhibit that apparently included a piece was the one that John Lennon saw and caused him to want to meet Yoko…and then…they got together…by the way – Yoko is 80 years old – you go Girl. PS. Puppy (above) is made of all flowers – cool!!!!!! 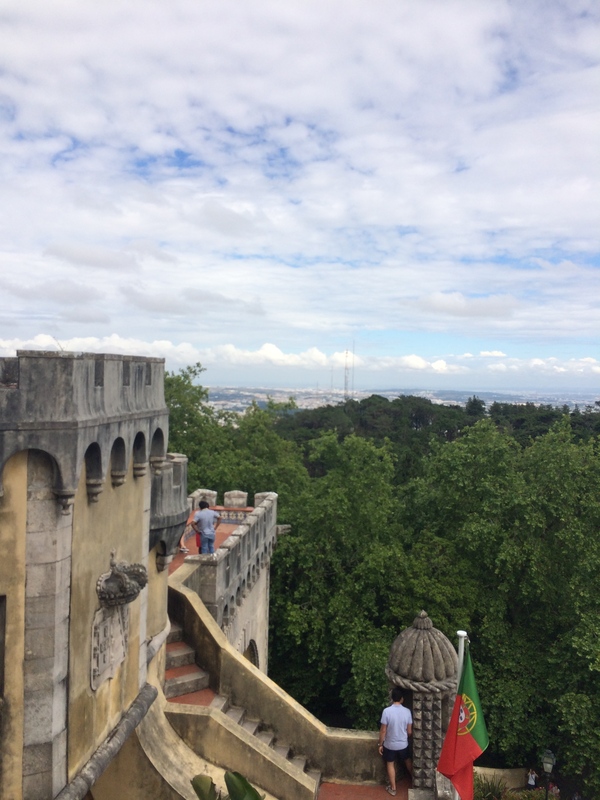 One of the things I am doing here regarding souvenirs is trading Rochester Fire Department patches for Joe….found the first one in Lisboa. Just happened upon it while walking around – cool! Exchanged patches with a Bomberos at the Estacion de Bomberos – his name was Carlos and very nice! Smiling, shook hands, said be safe and thank you. Took a pic of their truck – I think that was a volunteer station. Jose Cuis was this firefighter’s name at the Parque de Bomberos…so kind! Even though I speak limited Spanish and he know no English, we were able to communicate – love it. Figured out with hand signals that they do not have patches but the logo is ironed on and that he would be right back. 5 minutes or so later, Jose came back out with a shirt – wonderful! He was excited that the patch was coming from Joe – Joe in US meet Jose in Spain. Alrighty then. Day-maker! We stopped for a bite to eat then headed back to the ship so I could start duty at 9pm. 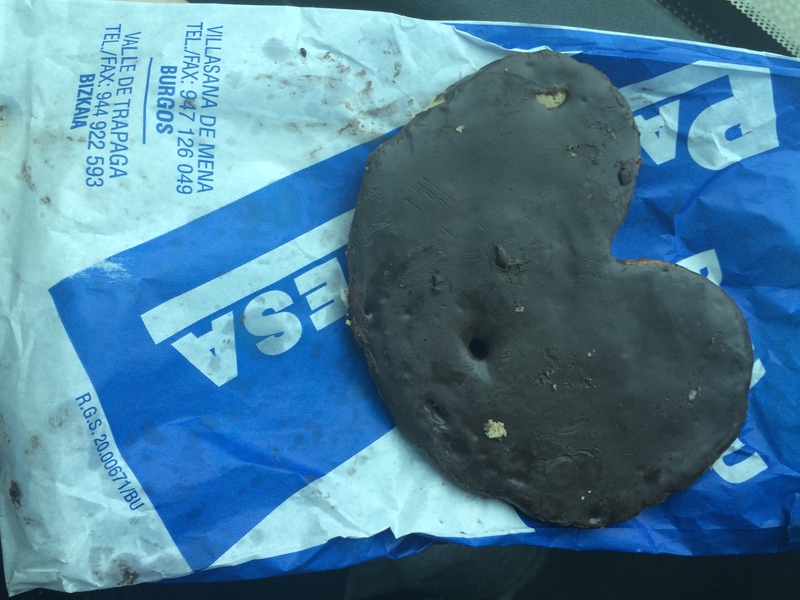 What was your Day-Maker today? Took a bus to San Sebastian today with Margaret, Stephen and Carly – a seaside town about an hour north of Bilbao…loved it! Nice to see some of the countryside on the way and be in the green for a bit. Getting to places is always part of the adventure. 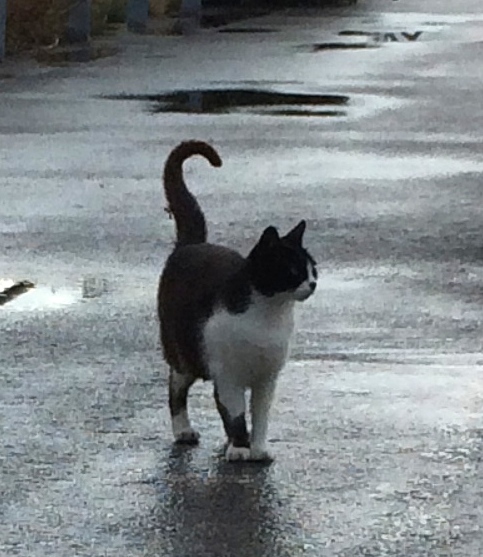 First we had to find the Termibus station on the map and walk there…Maps R Good. Bussing, training, metro-ing, walking…totally changes my view of transportation. Not so easy as getting in the car that sits in my garage ten steps from my house, that I can fill with gas anytime I want and drive to places I know without looking at a map #appreciation. Had a beach moment – went to put my feet into the bay – the Atlantic Ocean… “I can feel the sand beneath my toes, the beach gives a feeling, energy feeling, I believe in the faith that grows….” Third Eye Blind – thank you for they fitting lyrics! The wind picked up…nice for a bit and so pleasant to have the air freshen and the humidity drop. Then, out of the blue the wind ramped up to the point of being pushed back along the sidewalk! Hard to move forward at all! Weird. We nipped into a gelato shop – thank goodness – and to ease our stress we had a tasty treat to ease our pain. After a while, the wind died down and we started out for the walk back to the bus. Then to metro then walk to ship – walk, walk, walk then walk and walk. Then Home…We live on a ship. There were flocks of seagulls flying along side our ship for 2 hours last night! I saw them out my cabin window and said to no one, “Oh wow, seagulls!” and tried to capture their show on film. They would fly up into the air, coast for a while then bomb down into the water…sometimes they would ride a wave for a moment then take off again. I’m assuming there are small fish that get churned up by our wakes that create a dinner opportunity for our flying friends. 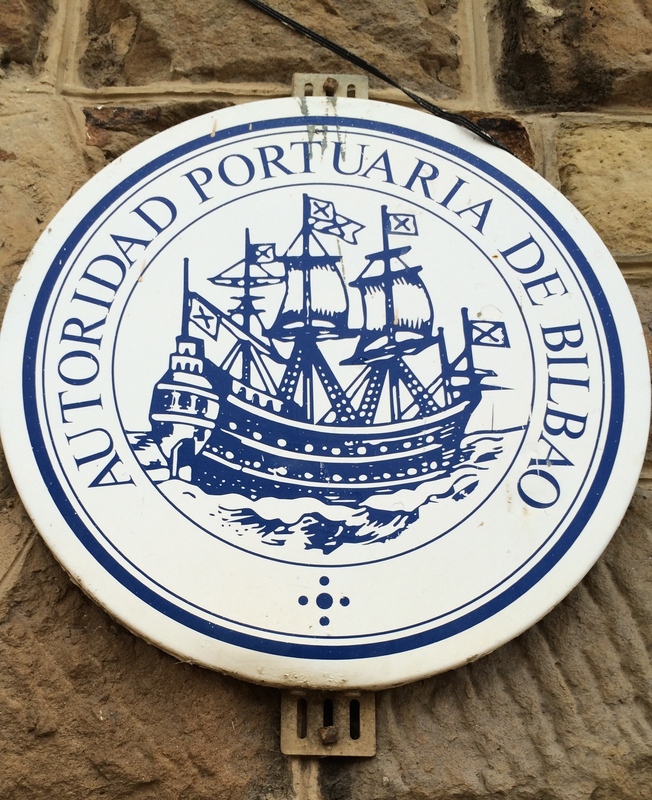 Docked in Bilbao, Spain this morning – early – I did not even feel us land – I was so tired! It was really cool to wake up in a new place…This port is very different from the last – we are a few miles from the city center so we have access to a shuttle – very nice! Free to us and runs frequently. 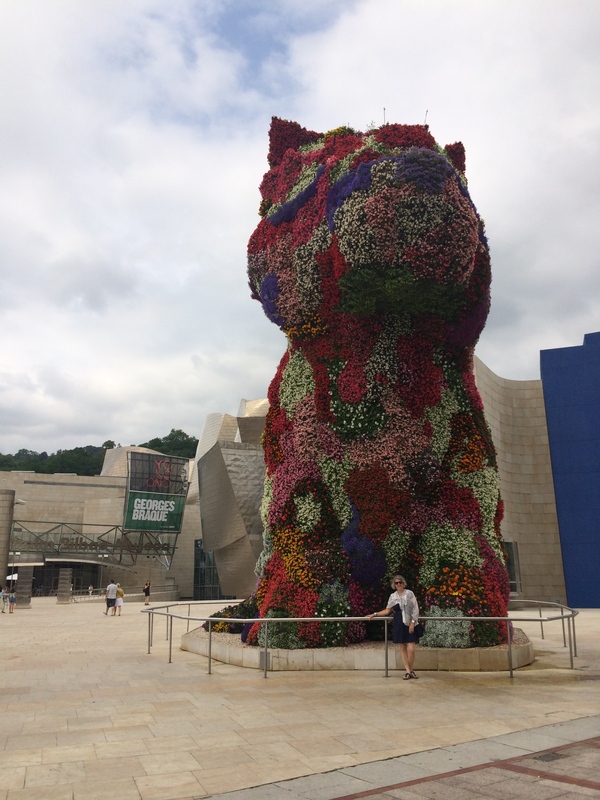 A group of us, Margaret, Pat, Stephen and others, looked all around Bilbao, going in and out of stores and taking a few breaks to eat Pinxtos – little tuna sandwiches, olives/sardines on a stick, seafood bits. Nice! You go up, get a plate and walk down the counter or bar, picking up your food treasures first. After Pintxo Enjoyment, you go back up and tell them how many you had and then pay. A nice system of trust, I say. In a fancy dollar store, I heard Kung Fu Fighting – a little strange to hear that in a dollar store in Spain! Is there a hidden meaning? What if Everybody was Kung Fu Fighting? What would that be like? and why? So many questions 🙂 Picked up only one item – an oversized deck of cards made in Denmark to use for a team building activity. Everything else was made in China – drats. 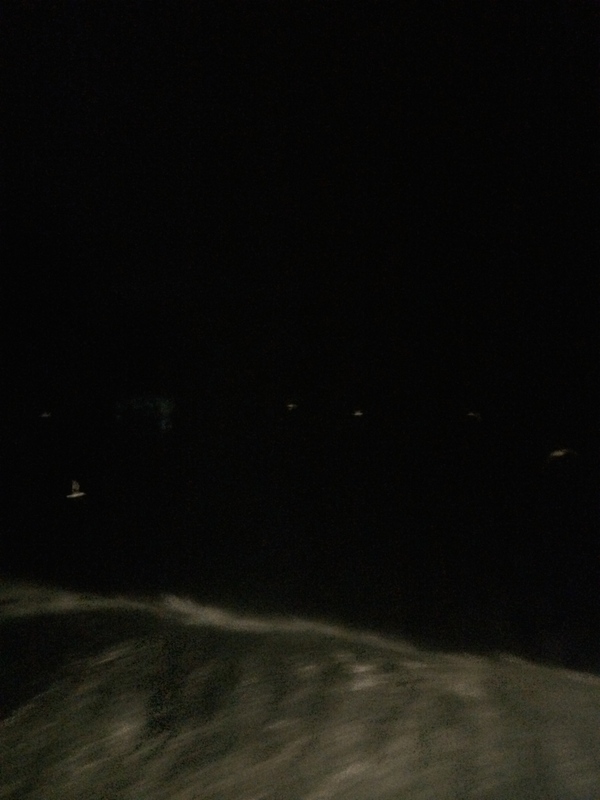 We’ve been passing along the coast of Spain and France all night – the coast is off our starboard side….but can’t always see it. Another day at sea and I was feeling better today…No seasick medicine, just sea bands plus lavender – yay! We went on a bridge tour this morning – up to Deck 8 – it was overwhelmingly cool too see the view from there – and to see us moving forward from so high up on the ship. Mostly, my view is from the port side of the ship – out my window on the left side of the ship…or a stern view – where we’ve been. It was also humbling and reassuring to see all of the instruments, manuals and equipment – and to know that every day – all day – someone is up there scanning every inch of the horizon to keep us safe. Just as I was lost in all of this thinking, admiring the view and getting a lite teary about how beautiful all the charts and flags looked, there were some oohs and ahs at the pod of dolphins leaping out of the water and moving across our bow. They appeared as if on cue. I’m sure the pictures don’t capture how freakishly cool this was to witness…so fast, so beautiful…then gone. 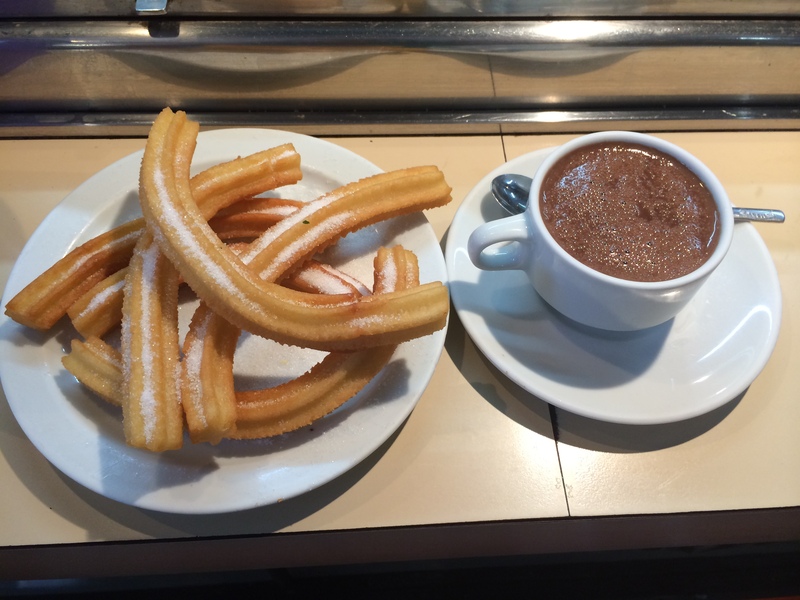 Had some wonderful conversations today, ate a life changing chocolate brownie and went to an informative Preport tonight – excited to try some new food…the language is Basque (not Spanish) the food in Bilbao is small tapas food – called Pintxos (“Peenchoes”). They are little single portion sized appetizers at most bars/restaurants. And fish called Bacalho (“Bacalow”) – should be interesting! So much learning – my brain is getting full. Felt like we had a week here – we here saw so much! This is a rich and beautiful city…the food, the history, culture…and the people were very friendly. I am sure we only saw a small piece of this place. 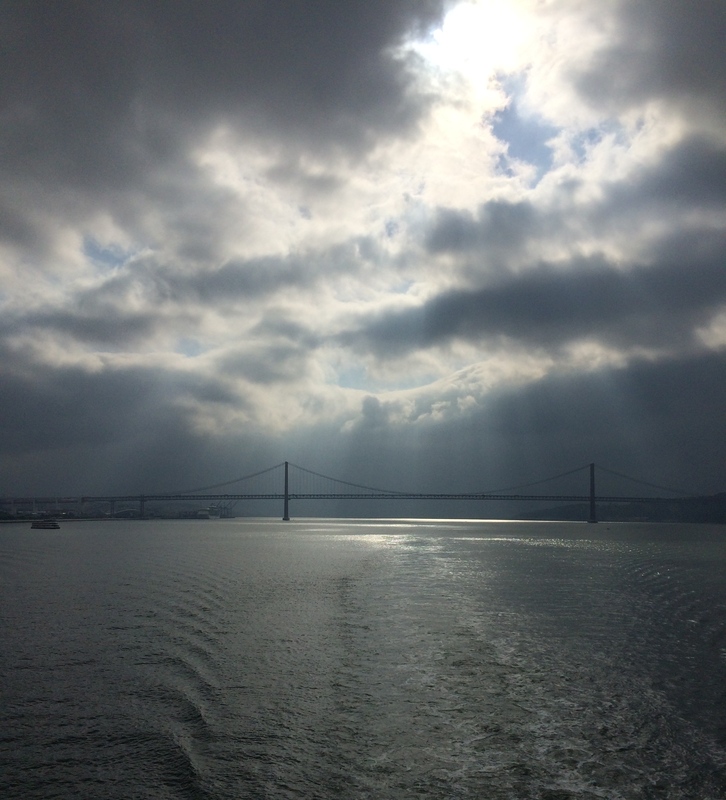 I have quickly realized I will not be able to see everything in every port – that’s OK! I am not quite into the routine yet of meetings, programs, work – wonder how long that will take? I had the chance to help some of my residents tonight. Small, doable issues but it feels so good to be asked! It hit me that I am an RD – even said it out loud to myself when I walked into my cabin…”I am an RD.” Funny. I appreciate how we get this great up close opportunity to work/learnt, laugh on this ship with students….I think I am going to become friends with a lot of them – love it! Walking and more walking…our ship is docked about a mile from the action so we got very good at estimating how long it took to get the train/bus/bica. Stopped in the post office today (post coffee) – cool do regular daily things in a new city. There was a ticket system that kept order…the ticket had a number that eventually would correspond tot the number of the clerk station – just had to wait for your number to show up on the display. Then there was a ding-dong sound and an announcement of the next number. There were 6 or so stations – only 2-3 of the stations had a person – but the wait was not too long. Lunch, then walk. Snack then walk. 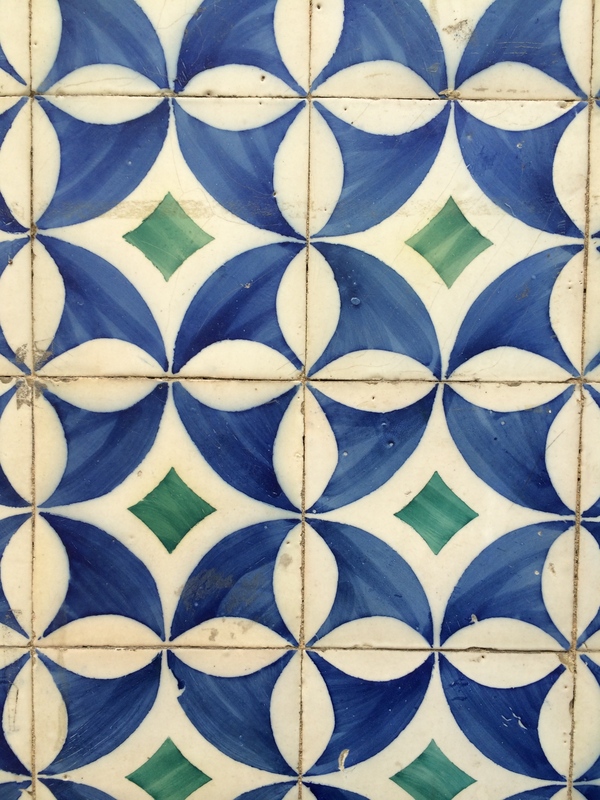 There are beautiful tiles on most of the buildings in Lisbon – all different in color and pattern. Most are a square 3 x 3 shape and cover a section of the building front. 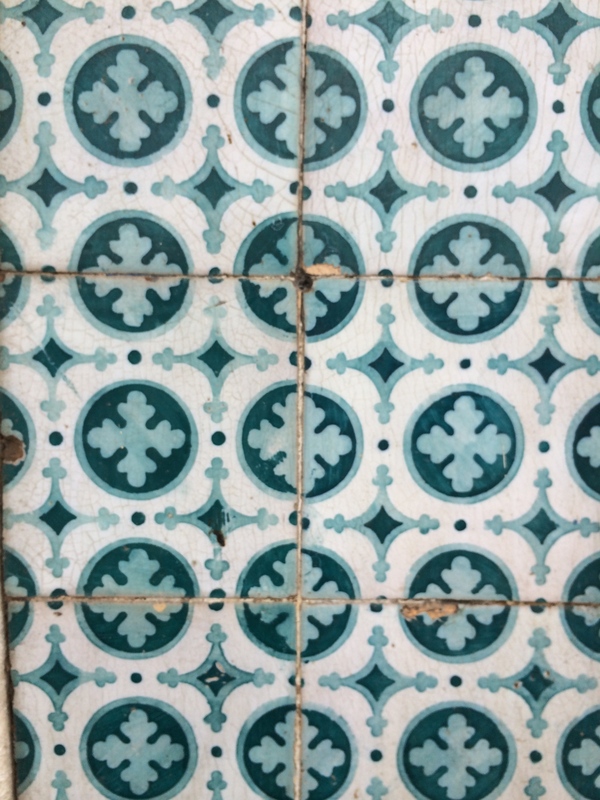 Taking pictures of the tiles became a bit of an obsession – I love them! So artistic and historic. Then the long walk back to the ship. We had to be back a few hours early to be prepared to help with the gangway situation – not a problem…this part of job is not so fun but it is a chance to chat with people when they are coming home…We waited in a restaurant right next to our ship – nice to get a last snack before getting back on the ship. There was a large student group there too – glad to know they are close to home. A few things happened in this port but overall the great news is everyone returned home to our ship safely…sigh of relief! 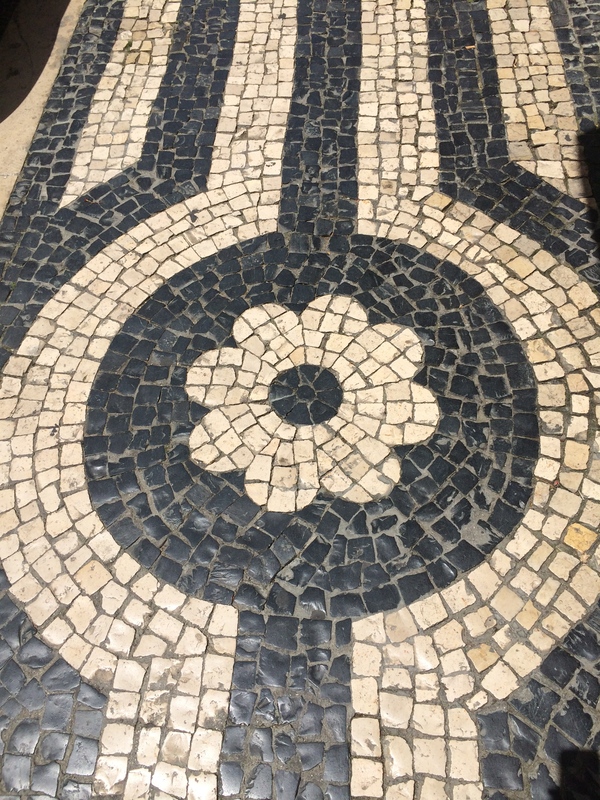 Sidewalks are all hand laid tiles…art! USA v Portugal Futbol last night! Ended in a 2-2 tie…probably a good thing…I was not there but heard it was a crowded, lively (drinking) experience. Pretty sure I would not have thrived in that whole scene. Exciting nonetheless. Was on duty for the first time last night – 9pm the first night til 9pm the next night… a flashback to my days as a Residence Hall Director at Cornell in 1986! Although, I am certain this is so not the same at all. Or maybe I am not the same. Also, we live on a ship. 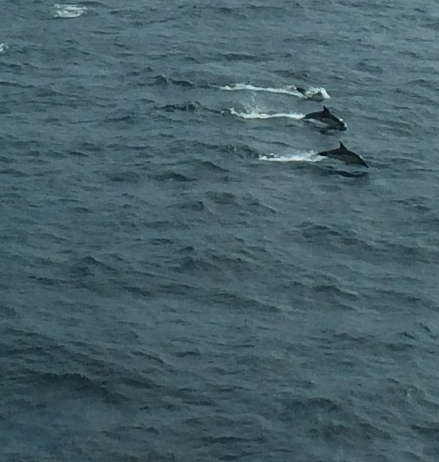 Was able to rest a bit today, reorganize a little and get ready for going back out to sea…. Oh and I cut my hair. In a desperate moment of “what is happening with my hair” – the ship water is very hard and a few strategic selfies convinced me it was time to cut. It is now a chin length bob – did the final trimming with my tiny Swiss army knife – that’s OK right? It’s all about using your resources. Where do I start? The views were breathtaking – could see all the way to the sea on one side and miles of countryside and towns on the other. Tiles, furnishings, art…every turn brought a new wonder. We spent most of our time here, enjoying the scenery, taking pics, learning, seeing lots of “SAS-ers” and appreciating the general awesomeness and historicalness of this place. Minor incident for me trying to get back on the train…the rest of my group – Margaret, Stephen and Joe (my boss!) had gone through the turnstyle by swiping their ticket across the reader which in turn opens the little door/gateway to go through. I was having trouble – my ticket was not swiping properly so the gate was not opening…I saw them get on the train but they did not see me right away so I started thinking through Plan B – catching the next train, finding my way back, do I need more money, etc. At the same time I was doing a dance with a train worker on the other side of the turnstyle who I think was trying to help – he was swiping something from his side at the same time I was swiping from my side which seemed to create a “gate not opening at all effect”. Then I tried to go through quickly behind someone else going through but the doors kept closing right on me, smashing on to my shoulders and squishing me back to the wrong wide of the gate. I would register the pain as a 6 on a 10 point scale – I am sure this is to deter others from attempting this at home. I tried each of these exit strategies a few times – back and forth between the guy on the other side swiping and me trying to go through behind someone – I would move over to where the guy is then try to go through, then they guy would come over to that turnstyle to swipe then I would swipe, then try to go behind someone. Honestly. Apparently it was quite humorous from the other side, as Joe so kindly shared with me once I was on the train…a good laugh to be sure! No need for Plan B. Another easy, late dinner/snack on Deck 7…veggie burger and fries = fav…nice to have this as an option if you miss dinner. Everything about this ship is a luxury to me. 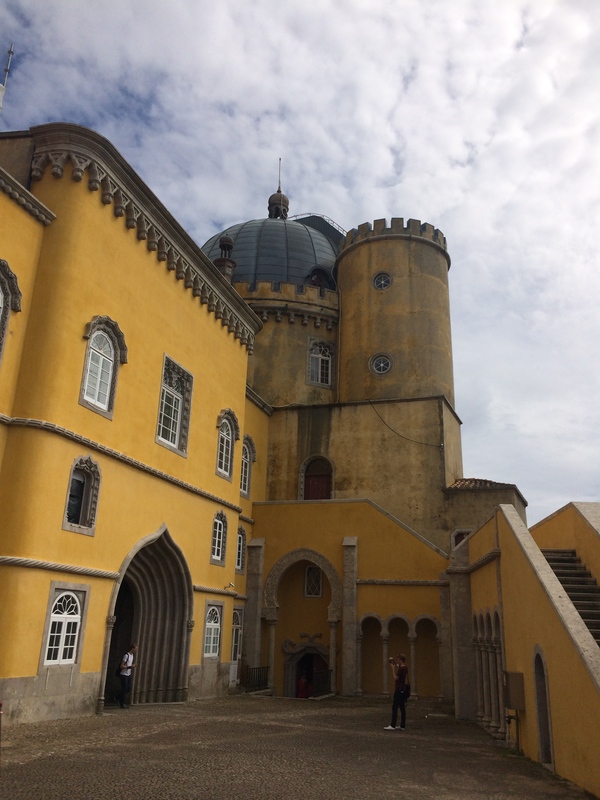 Headed out fairly early after learning A LOT in last night’s Preport…most importantly – Portugal is not Spain and the language is Portuguese not Spanish. Obvious, I know and I speak very little Spanish anyway but I kept wanting to tryout some Spanish…a few things are the same but not enough to converse…learned enough to get by and most everyone was friendly and helpful. Oh and “desculpe” (pronounced dehshkulpay”) means excuse me. So there’s that. I used that a lot! Key goodies to be had here on Lisboa (Lisbon in Portuguese) – Bica (strong shots – or two – of espresso called a “duple bica” – yes please). I got hooked within 24 hours and had to recommit to decaf once on the ship. Yikes. 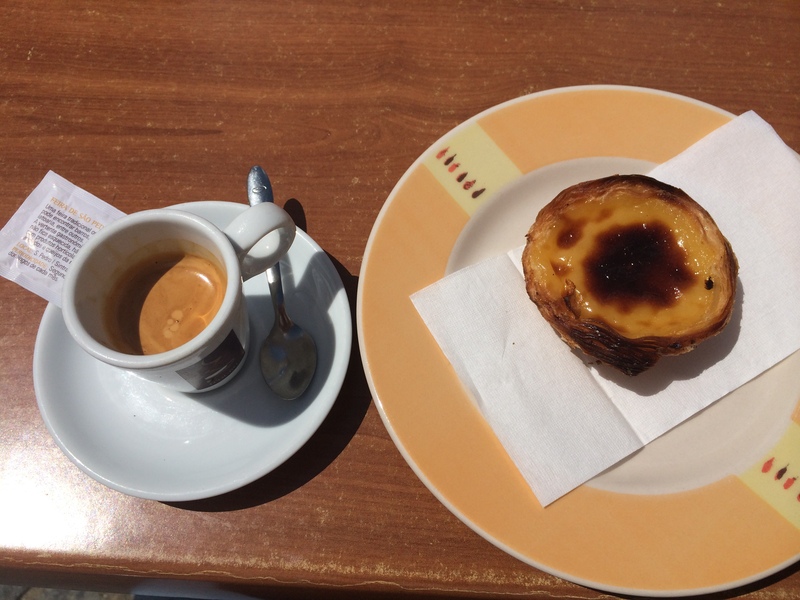 Bica good…..add a “pateis de nata” and life overall becomes great. Pateis de nata (pronounced “pastesh duh nahta” is a round, flat, flakey pastry with a custard-y tastiness in the middle, topped with crystalized brown sugar – kind of like how a crème brulee is made. Sold single or in packs of 3-6. OK! Duple bica y uma pateis de nata, por favor! Went walking around the Barrio Alto – an old, quaint part of the town and did some “eye shopping” as one of my new ship/crew friends, Jill calls window shopping…and actual some real shopping. The vibe here is celebratory because the World Cup is in progress and will be shown live on a HUGE screen in one of the open town square type areas… USA will play Portugal tomorrow – woo hoo! Some of it is touristy but most of it is really different and intriguing. There is a pedestrian walkway with shops, street vendors, performers and people from all over the world. Had to pay a little more attention here for pick-pocketers. Also, drugs were offered pretty freely here to us as passersby. Hmmm. We are not in Fairport anymore. Had a late lunch at an Italian-ish restaurant (delicious) after trying to get to a recommended buffet place called Rosa da Rua located on Rua da Rosa – got there at 2:59pm….they closed at 3. Drats! Most place close for a few hours in the afternoon. Walked back (a lot of walking!) 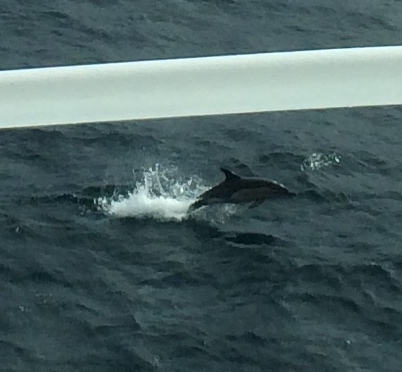 and hung out on Deck 7 on our ship. The pool is up there and the nice snack bar offers hot, cooked food, smoothies, snacks and sodas during the day and into the night…this is some life. 99% of these students appreciate everything that is done for us. I hope that someday the other 1% get it. 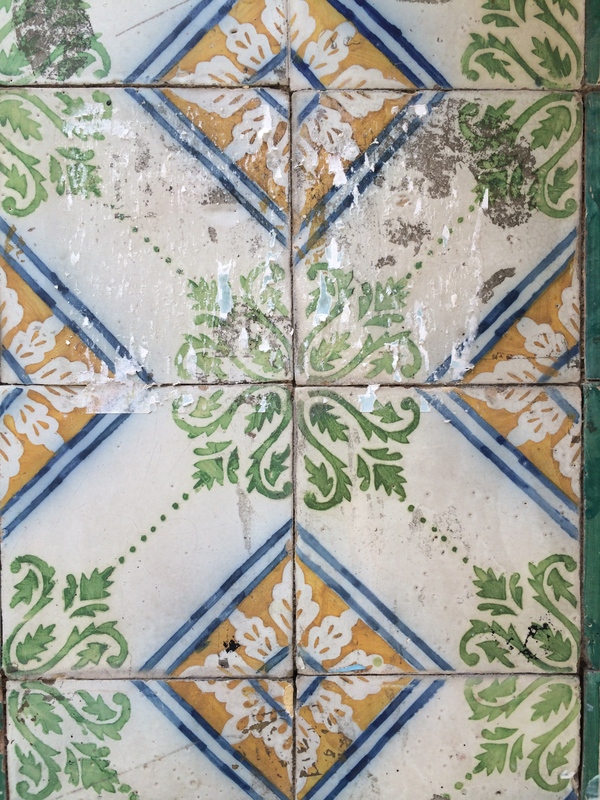 Word of the day is Appreciation…and Tiles….more about the tiles here later….